FiTech Ultimate LS1/LS2/LS6 EFI 500 HP EFI Systems w/Trans Control 70002 | Proformance Unlimited Inc. The Ultimate LS1/LS2/LS6 500HP Intake Manifold Kit with 92mm throttle body and trans control are a complete self-tuning induction systems for LS engines designed for the do-it-yourself hot rodder to the professional EFI tuner! This system is ready to go with everything needed to complete the induction system of your LS engine and get you on the road easily and faster than any system on the market today. Forget sourcing mismatched parts and cutting and splicing old harnesses and re-flashed ECU’s from “Craigs List” tuners. 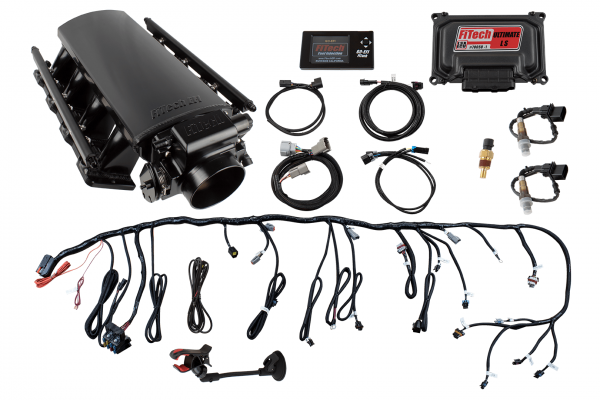 FiTech’s Ultimate EFI is a complete Kit. Suitable for that junkyard 5.3 to a stroker 427, we have you covered! Check out the list of features and you will wonder why it’s never been so simple to ditch that old factory hardware or top off that fresh long block. We have taken the work out of getting your new or pull-out LS up and running in a flash. That’s why we call this intake manifold kit the Ultimate EFI. Application: Intake manifold will fit Cathedral Port LS1/LS2/LS6 heads. Transmission control feature is suitable for 4L60, 4L65, 4L80 or 4L85 GM transmissions.